Video: Put Down The Box! Mr. D TV is my (allegedly) weekly teacher advice video series. I cover just about any topic related to education and teaching. If you have a question you'd like me to answer, email me (teachforever@gmail.com). If you like the video, check out the last episode and my YouTube channel for more. Book Giveaway: Ten Cheap Lessons! I just received an shipment of my books last week, which I ordered mainly so I could find ways to get them in the hands of teachers who would benefit from them. 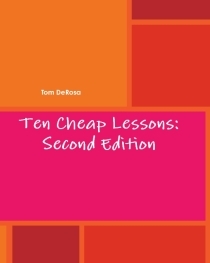 It's been a while since I've had extra copies of Ten Cheap Lessons: Second Edition, the updated version of my first book. If you haven't heard about it before, TCL is a teacher resource book built around ten adaptable, low/no cost lesson ideas. Each chapter contains a complete lesson and a framework for extending/adopting it to fit the widest range of subjects and grade levels. The second edition adds bonus ideas and examples and a photocopier-friendly spiral binding. Read what readers have said about TCL just last year. You can still get the original on Amazon, but this version is only available on-demand from the publisher. I'm giving this copy away to a teacher that really needs it: just email me by 11:59 CST tonight and tell me how this book might help you. I'll pick one lucky reader and send them a hard copy. Spent Challenges You to Prove That You Can Live Poor [Lifehacker] - Intriguing online game that forces you to figure out how to live on your last $1000 for one month. Money Skills Your Teen Needs [WalletPop] - Includes info about a U.S. Department of Treasury/USDOE collaboration to improve financial education for teens. When are we going to stop teaching students about the half dollar? This was my thought as I observed an excellent Kinder math lesson at one of our schools recently. I'm not surprised this is still taught in schools or as part of the fantastic Mathnasium curriculum. It's wonderful as a concept: it's one of the first examples of the idea of "half" that we use in elementary math. Here's the problem: nobody uses half dollars any more. It's akin to using $2 bills, 8-tracks or floppy disks for real world context: it doesn't work, because nobody uses those in the real world any more. It's what Dan Meyer and Jo Boaler refer to as psuedocontext; a completely unrealistic problem, posed as a "real world connection" that isn't. Why are we still teaching it? Because it's convenient? Because Kinder kids don't know yet that the half dollar is obsolete? I'm sure many notice that when people have pockets full of coins, no one seems to ever have any half dollars on them. On a similar note, what are teachers going to do when there's no more pennies? How long will it take until pennies disappear from circulation, and then how much long will it take for it to disappear from classrooms (if ever)? When they're gone, what crutch will we use to teach ones? Or will we just skip ones when talking about coins and just use them when we're talking about dollars? I'd rather schools ween students off the half dollar and at least consider using the dollar coin more. Sure, they're not ubiquitous either, but they're used significantly more than half dollars. Just as the penny will likely die, paper money might be replaced by coins (as it is in many countries around the world already) in our children's lifetime, so doesn't it make sense to at least introduce something at least slightly more relevant? As educators, we've got to constantly reevaluate the real world examples we use in every subject, at every grade level. It doesn't take very long for them to become examples of a world that no longer exists. When we reach for the remote control and turn on any news station it seems as if there is one headline we cannot escape: Horror stories of teen bullying seem to be occurring all too often. As an educator you know the importance of teaching and protecting your students from such abuse. I am contacting you on behalf of The Circle of Respect, the National Crime Prevention Council’s (NCPC) latest campaign to protect youth from bullying and cyberbullying. The campaign teaches that such behavior is unacceptable through a positive message that encourages respect and consideration for others. Did you know 160,000 kids miss school every day out of fear of being bullied? The recent cases of young people who have tragically ended their lives because they were so badly bullied are a painful example that there is a serious problem in America today. There is no better time than the present to start changing these statistics…and we can do so through education! - Circle of Respect Book Club: Take part in the online Book Club to generate a guided national discussion about this issue. The Book Club will feature one book each month on the Circle of Respect’s website by a noted author in the field of bullying and cyberbullying. Each author will also lead an in-depth discussion via a downloadable podcast. - Sign up for Email Alerts: Sign up for email alerts to get updates on the campaign, find out how you can be involved, get sneak previews of what's happening next, and even enter contests. - Make Your Pledge: What actions will you pledge to take in order to spread awareness and widen the Circle of Respect? Let us know. - View Pledges: Sign up for your own free account on The Circle of Respect to see what others are doing to help. - Take Awareness Video Viral: NCPC and Saatchi & Saatchi unveiled an animated short starring everyone’s favorite crime dog, McGruff®, to teach a whole new generation of children how to “Take A Bite Out of Crime." - Simply spread the word: It’s as easy as it sounds. Share the campaign online via your social networks and also talk openly with your children, grandchildren, nieces, nephews, and/or peers. - Join us on Facebook: Become a fan today and share your ideas and stories with the community. Visit: www.facebook.com/pages/Circle-of-Respect/175965669110936. For more information, visit http://www.circleofrespect.org. Teachers typically experience a strange relationship with students. Our students are simultaneously very familiar with us because of daily class routines and completely unfamiliar with us when it comes to who we are outside of the classroom. In fact, most students seem to only see their teachers within the academic bubble, which can cause some skewed perceptions about who we really are and what we really are like. Some students may even be mildly surprised to hear that we live outside of the school! This certainly is not necessarily bad, as some of the things that our students never seem to realize about us have fueled many a lively and laugh-filled teacher's lounge discussion. 1. Teachers have their own lives outside of school. It makes us smile whenever we see our students awkwardly approach us at the grocery store because we know they are surprised to realize that gasp! we shop at the same places as everyone else. As mentioned before, none of us live inside the school. Some of us do not even live within a 20-mile radius of the school. In fact, we have our own homes and families outside of school, and enjoy doing things other than grading homework and planning lessons (though that is undoubtedly a great passion for us). We may enjoy running marathons on the weekends or whipping up a new recipe. We may be huge film buffs or sports fans. We may even be writing the next great American novel during our time off. The fact of the matter is that while we love teaching, we love other things outside of school, too. 2. Teachers do not seek to make their students miserable with exams and homework. We have heard our fair share of complaints about how we try to ruin our students' lives with homework and tests. However, that is never our intention when we plan assignments. We assign homework because we need to make sure that our students are on track. After all, some subjects are incredibly tricky, so rather than wait until the final exam to find out that some of our students never understood the topic, we assign homework throughout the semester to gauge how well everyone is comprehending the material. Incredible care goes into planning how much homework to assign and when to schedule tests. We always want to make sure that our students have adequate time to complete everything and study. 3. Teachers do not have as much control over their syllabi as you might think. Though we plan how we'll approach a topic and the assignments that go along with it, we have less control over our syllabi than you might think. We do not handpick each of the poems we cover or the animals we dissect. The school or state largely determines what exactly will be taught by us in the classroom. The novels we teach, the theories we cover, and the formulas we examine are all pre-determined. This is done so that every student is guaranteed the same full educational experience that covers all of the things deemed too important to not learn about, such as groundbreaking fictional works by acclaimed novelists or essential mathematical theorems that will prepare students for more complex math equations in the future. 4. Teachers care about their students. We care about our students more than we may show. We sincerely want each and every one of them to succeed. Teachers will do what they can to help students, but they also need the students to help themselves. If a student is struggling in class, we will do what we can to make things clearer and help him or her pull up a low grade. However, for all of our effort, we also need to see that the struggling students are willing to work and help themselves as well. We can only make it so much easier for our students. After that, it is up to them to take care of themselves. 5. Teachers have their good and bad days, just like anyone else. Some days are better than others for us. We have headaches, bad moods, and good moods, just like everyone else. We work hard to not let that affect our teaching, but there are times when we can be less than patient with our students if they are acting up. On the days where we are not feeling 100%, we appreciate respect while we pull ourselves out of our funk and carry on. This guest post is contributed by Kitty Holman who particularly enjoys writing about nursing colleges. Questions and comments can be sent to: kitty.holman20 @gmail.com. As educators face a scarcity of supplies for their classrooms and school libraries as a result of budget cuts, the company’s new Swap4Schools program (http://swap4schools.swap.com) aims to assist them in procuring much needed supplies - for free. To enlist in the program, school administrators, teachers, and librarians at U.S. public schools, grades K-12, can create a free account and build a list of books and other media items needed for their classroom. Then, any of Swap.com’s 1 million members who own those items will have the opportunity to donate them to a school in need. Swap.com will waive transaction fees for members who choose to make a donation, so the only cost is shipping for those who want to help out! The program also empowers moms who are eager to help with easy online access to a list of items their child’s school needs. Within the program’s first week of operation, educators have signed up across 40 states and received nearly 2,000 donations! I'm still partial to PaperBackSwap, but this goes a step further because you don't have to give something in return. Any resource that allows you to build your classroom library on the cheap is okay in my book. Have you tried this service, or are willing to test it out? Share your experience in the comments. What does an education cost? [via Building Tomorrow] - "Building Tomorrow's calculator enables anyone who went to school in the US to determine the cost of their own 1st through 7th grade education by simply entering the year they were born and the state where they went to school. Behind the scenes, the calculator accesses years of current expenditures per pupil (CEPP) data originally compiled by the National Center for Education Statistics. All of the data is quickly converted to current (2007-2008) costs for easy comparison." According to the calculator, my New Jersey education cost about $95k, which would provide elementary education to 271 students in Uganda. That's a pretty huge impact! Learning Chocolate - A simple, straightforward resource for children to learn and practice English vocabulary. The Boardgame Remix Kit Combines Your Old Games Into New Ones [Lifehacker] - Great project for you and your children if you're home the last few days of Spring Break! Play Outside With 225 Kid Outdoor Games [Wired: GeekDad] - All in a handy iPhone app! The Company Store (www.thecompanystore.com) has just launched a Kids' Design Contest as part of its comforter donation program. Now through March 27th, we’re accepting original artwork designed by children 12 and under that is created with the inspiration to brighten the spirits of homeless children. From March 28th through April 22nd, Facebook fans will vote on the submitted designs. The highest voted design will be “printed” on thousands of comforters that The Company Store will donate to homeless children around the country as part of its Buy One, Give One program – since January 2011 for every comforter a customer purchases, The Company Store donates a comforter to a homeless child. Plus the top three voted designs in the contest wins a gift card for the child designer. If you or anyone in your organization is interested, we would sincerely appreciate a visit to the Facebook page for The Company Store (go to www.facebook.com/companystore and click on the Kids' Design Contest tab on the left). We value giving back to the community through the comforter donation program and hope this contest helps inspire creativity among children as well as educate about homeless children in America. I like that the real "prize" is the satisfaction of helping a lot of people (with a gift card thrown in as a bonus). Study: Do Video Games Make Kids Fat? No. [Educational Games Research] - Counterpoint to what you might frequently hear reported on network morning "news" shows or you local "news". 10 Schools With Amazing Educational Design [Architizer Blog via GOOD] - What would it take to get this kind of design available for any forward thinking school district, without the public footing an insane bill? Make Them "Your Students" [Sup Teach?] - A simple, powerful idea you can use on Monday. Combo Book Giveaway: 2 Books Full of Card Games! This week's giveaway is what we in Texas call a twofer: one lucky reader will get both Crazy Eights and Other Card Games by Joanna Cole & Stephanie Calmenson AND 101 Best Family Card Games by Alfred Sheinwold. Card games certainly aren't the hippest things for kids to play with, but I believe they belong on a short list of toys/games that every kid should play with growing up. Pick just about any card game at random and you'll find that the skills needed to master the games are essential skills for children to master: grouping, ordering, counting, simple math operations, following directions, taking turns, and sportsmanship (among others). Crazy Eights outlines games in a kid-friendly way; you can simply hand this over and let them have at it. 101 Best is more of a encyclopedia of family-friendly games that a parent or teacher could draw from. Of course, I'd encourage you to modify and extend the games (or encourage the kids to do so) to broaden their impact. As with any good resource, it's all in how you use it. I think these are complimentary resources, so I'm giving them out together. If you're interested, just email teachforever@gmail.com by 11:59pm CST tonight and let me know how you intend to use these books. I'll pick the most compelling entry and send them both books! If you've won anything from me in 2011, sorry, but you're not eligible this time around. Got to spread the love.